K and I will be setting up a CocoEasy booth at The Local People X SAM Art Week Day Market this coming Sunday from 10-7pm! Please come by and say hi if you are there!! Oh yes, if you are wondering what in the world is CocoEasy, just check out the video below! Don’t you just love the song chosen by K lol. What does vanilla+basil taste like? Find out now! Discover on your palate the precise taste of heaven, with the blend of Pierre Hermé Paris “House” vanilla and Grand Vert basil. Now available in both London boutiques for the month of July. 1. $75 for a box of 12 Pierre Hermé macarons, assorted flavours including JARDIN D’EDEN as shown above. 2. $90 for a box of 15 Ladurée macarons, assorted flavours. 3. $40 for a bottle of Christine Ferber jam (confiture) from Pierre Hermé, your choice of flavour. 4. $85 for a box of Pierre Hermé chocolate pralines (approximately 28 pieces), assorted flavours. What’s included: whatever is given upon purchase, i.e. paper bag, original box, catalogue and whatnot. Date of arrival: 30th July 2012. I do not wish to further compromise the taste and freshness of the macarons so if you can’t collect them on 30th or latest 31th), please do not order. Mode of collection: Mass meetup at central area, venue/time to be confirmed later. Payment mode: POSB/DBS Internet Banking or ATM Transfer. No interbank transfer. Deadline: All orders and payments have to be made by 26th July 2012, 9pm. – Only paid orders will be taken. – No cancellation of order is allowed once payment is made. – Full refund will be given if spree is cancelled or I can’t buy the items for whatever reason. – If GST is incurred, all participants will share the cost. Lastly, please do not join if you’re uncomfortable with the T&Cs. Thank you! 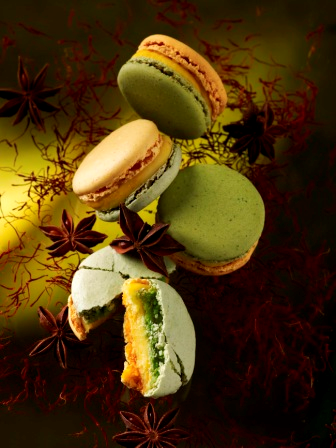 The new Jardin macaron has a refined taste in the Oriental style, combining fragrant saffron with aniseed in a subtle alchemy of flavours. Stimulate your taste buds this month with the newest addition to the Jardins collection. 1. $75 for a box of 12 Pierre Hermé macarons, assorted flavours including JARDIN DU PARADIS as shown above. Date of arrival: 13th June 2012. I do not wish to further compromise the taste and freshness of the macarons so if you can’t collect them on 13th or latest 14th), please do not order. Deadline: All orders and payments have to be made by 10th June 2012, 9am. Heading to Paris tomorrow and taking orders for macarons, chocolates, pastries (basically anything and everything, haha) from pâtisseries like Jacques Genin, Gerard Mulot, La Pâtisserie des Rêves, Sadaharu Aoki, Pierre Hermé, Ladurée etc etc. The assorted caramels from Jacques Genin are a.m.a.z.i.n.g. Such an intense taste in a small smooth package! Flavours range from passion fruit mango (my favourite) and vanilla to fresh ginger and nutty pistachio. Sold by weight, these don’t come cheap, but worth every cent, imo. Email me (qiuyi_ong@hotmail.com) for enquiries on pricing etc. Macarons’ prices still stand as before. Date of arrival: 22nd April 2012. Deadline: All orders and payments have to be made by 18th April 2012, 9pm. Lastly, please do not order if you’re uncomfortable with the T&Cs. Thank you! I’ve just came back from London early this morning and will be heading back again the day after tomorrow, yay me. For those of you who didn’t manage to get the macarons from Pierre Hermé the previous time, fret not cuz I’m doing another spree this time, albeit a very last minute one. Spring has finally arrived in London and Pierre Hermé has launched a new collection to celebrate the season. A pleasant surprise that was when I went to the boutique a couple of days ago. Bright and cheery, the latest flavours include Mosaic (pistachio, Morello cherries, cinnamon), Eden (peach, saffron, apricot), Métissé (orange, carrot, cinnamon), Menthe Fraîche (fresh mint), Infiniment Vanille (vanilla), Plenitude (chocolate, caramel) etc etc. Plus, for the month of April, as part of the “Les Jardins“ series, there’s a special limited edition flavour called Macaron Jardin Secret, a trio of rose, vanilla and clove. Does that sound intriguing or what? So if you are keen, drop me an email asap : ) More details below. P.S. Accepting orders for Ladurée too. Guess what, they’ve just increased their prices across the board after 1st April, boo. 1. $75 for a box of 12 Pierre Hermé macarons, assorted flavours. Date of arrival: 10th April 2012. I do not wish to further compromise the taste and freshness of the macarons so if you can’t collect them on 10th (or latest 11th), please do not order. Deadline: All orders and payments have to be made by 6th April 2012, 9am. Accepting orders for Pierre Hermé’s and Laduree’s macarons/pralines/jam now! 2. $85 for a box of 15 Ladurée macarons, assorted flavours. Date of arrival: 4th April 2012. I do not wish to further compromise the taste and freshness of the macarons so if you can’t collect them on 4th (or latest 5th), please do not order. Deadline: All orders and payments have to be made by 30th March 2012, 7pm. As usual, will be taking orders for Pierre Hermé’s and Ladurée’s macarons. I tried the latter last month when I brought a couple of boxes back from London and I still didn’t like them. No idea why so many people are raving about Ladurée, oh well. Anyway, these babies will arrive on the first day of Chinese New Year! No better time to share these with your loved ones. Due to some personal requests, I’m also bringing back pralines and jams! Diversification, haha. 2. $75 for a box of 12 truffle macarons from Pierre Hermé, subject to availability. 3. $85 for a box of 15 Ladurée macarons, assorted flavours. 4. $40 for a bottle of Christine Ferber jam (confiture) from Pierre Hermé, your choice of flavour. 5. $85 for a box of Pierre Hermé chocolate pralines (approximately 28 pieces), assorted flavours. Date of arrival: 23rd January 2012. I do not wish to further compromise the taste and freshness of the macarons so if you can’t collect them on 23rd, please do not order. Deadline: All orders and payments have to be made by 19th January 2012, 7pm.